It has been some time since writing this blog, so whilst I am indeed writing from the Cameron Highlands in Malaysia, I have a lot of filling in to do on our Cambodia and second Thai experience. My last blog reported from Vietnam. Following that relaxing island week, we took a less relaxing journey across the border to Cambodia. This consisted of a hydrofoil across to the mainland, whereby Matt and I were surrounded by people being sick. The strangest thing about the boat is they played a couple of films to try and take people's minds off the violent pounding across the waves that felt a bit like a tumble dryer in your belly. Bearing in mind the boat was filled with young and old, the films they chose were graphically violent Japanese gangster style movies with plots based around which nightclub owners offered the best prostitutes and strippers in between knifing their competitors. An odd choice, made even stranger by the Vietnamese language talkover, which consisted of one women's voice covering every actor's role. A jam packed bus ride later, followed by a night in the border town of Chau Doc, saw us leaving Vietnam by way of a slow, lovely... but very slow... boat ride through the Mekong to Cambodia. The boat ride offered a really good view of the traditional Vietnam of paddy fields and farmers in their cone hats. Its very beautiful. We ended up doing a flying trip through Cambodia. We started with a few days in Phnom Penh. Here we visited S21 - the school turned detention centre under the Polpot regime. They show a very moving film there taking you through the story of a woman whe ended up at S21 and finally in the Killing Fields. Both places are shocking and moving. The fact that a city that now numbers a poplulation in the millions was reduced to 40,000 people as its inhabitants were forced into labour in the farms in the countryside is one of the more comprehensible yet still astounding facts. Walking round the museum of S21 a number of photos of the people who were victims there, feature on the walls. It really struck me, when you'd see young people in the modern clothing and hair styles and its a sharp reminder that this is very modern history. Walking around the memorial of the Killing Fields you suddenly realise that the scraps of cloth in the ground is the clothing of the bodies left there still intact, and actually that white flint looking stone over there is bone. After seeing the worst of what mankind can create, it made an uplifting contrast to head to the Temples of Angkor and see mankind's creativity in a much more positive light. We stayed in Siem Reap, a touristy but fun town outside of Angkor. The temples themselves were really great to potter around. We bought a 3 day ticket, travelling around by tuk tuk with a driver on the first day, and then hiring bikes for the next two to cycle around at our own pace. The temples are in a really beautiful forest so it made of some nice shady bike rides. We flow out of Siem Reap just before Christmas and headed to Krabi to begin 3 weeks of beach and island life in Thailand. Christmas Day was spent doing a 4 island snorkelling day trip ... in the pouring rain! Our boat driver told us how lucky we were as it rarely rains on the andaman coast this time of year. We actually felt more cold than lucky! Christmas dinner was pizza and pasta at an Italian restaurant with a carafe of red wine. Not quite up to the Christmas dinners of the Canavan household, but a treat to have some red wine! Krabi is a surprisingly quiet little town, but we found it quite appealing. This was probably as much to do with the very affordable and great quality accomodation as anything else, but it was a base to travel round to see other sites. We spent a day in a small rainforest a 30 minute drive out of Krabi. I'd read about a 2km nature trail that sounded quite nice. Well, I think we somehow ended on an extreme hike up a mountain face, which we hadn't exactly planned on. 3 hours later we got to a very beatiful waterfall and natural swimming pool, so it was worth it... never did find that nature trail. From Krabi we headed over to Koh Lanta for a few days. Koh Lanta is a really chilled out island with some beautiful beaches. Again, you can do some great drives around the island to get some amazing views. A drunken new year eve, a new year day spent throwing up ALL day... and time to move on for a detox. We decided to head inland for a few days and headed to Khao Sok. Khao Sok is a village high in the hills surrounded by a beautiful national park. We spent a lovely few days here trekking in the forest. One day trip involved going to a nearby dam, that had been created in the 80s by flooding a whole valley, which included a number of villages. What were once mountain peaks rose out of the water, and the remains of what would have been tall trees could be seen peaking out of the lake. We travelled through the lake by boat, and it was lovely to swim in its crisp water. After lunch we were taken on a pretty rigged trek to a cave. We were taken through the cave for about 90 mins. The cave has a stream running through it, which was pretty deep in places, so you ended up having to swim through in places. it was filled with bats, and we also found a toad, so quite exciting! From Khoa Sok we headed to the Gulf coast of Thailand. We were aiming for Kho Tao, but ended up spending a couple of days in Ko Samui enroute. I was pleasantly surprised by Ko Samui as had expected a really really touristy place. i think it would actually be somewhere you spend quite a bit of time as there seemed to be loads to do, including some great walks inland. However, we were on a mission to get to Koh Tao (diving mecca) so headed out of there. By this time in the travels I have invested in some pretty powerful sea sickness pills, which I have been very very thankful of. The boat ride to Koh Toa is probably the time I was most thankful of this. These pills have a slight tranquelizer effect, so within about 10 minutes of getting on the boat to about 10 mins before getting off I was out cold and just vaguely aware of a slight bouncing effect. 'Iron stomach on the Sea' Matt, informed me it wasone of the worst crossings he has ever had, not helped by the vommit domino effect that took place throughout the boat. We headed to a smaller bay called Chalok in Koh Tao. Its a really beautiful place, with high forested hills in the middle, steeply falling to turquoise blue sea. We spent a week in Chalok, finding a great little diving outfit. We took a couple of fun dives and decided it would be a good opportunity to do our advanced diving qualification. Some deep diving, attempts to use a compass underwater, fish spotting, underwater photography, acrobatics underwater with a hoop and working out how to use a dive computer followed, resulting with us now being the proud owners of our advanced diving card. Due to the week spent diving, we decided to head straight to Malaysia. We have been here a couple of nights, starting in Georgetown in Penang and now in the Cameron Highlands. 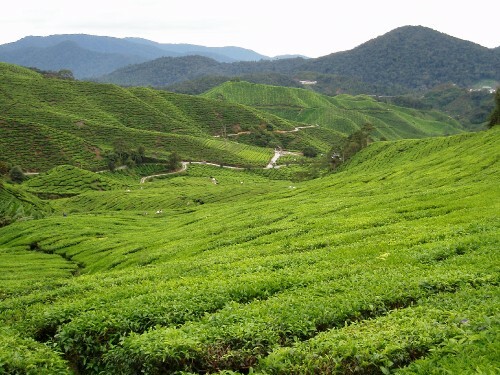 We've really enjoyed the Cameron Highlands as there are some lovely jungle trails and the climate is refreshingly cool. Its an odd place with lots of reminders of its English colonial past. The surroundings are full of big tea plantations and strawberry farms. This leads to Cream Tea scones being one of the main gourmet offerings in all the cafes - quite surreal! When the English people created the tea plantations they also brought over 'expert' tea growers from India (not convinced by how much choice they had in the matter). This means besides the cream teas, the other main food offering here is South Indian curries. So how British can you get.... a cream tea followed by a good curry! A highlight of our time here was a trek we did yesterday. We were just about to head off down a path when we noticed a monkey up above. We sat down and were given an amazing monkey acrobatics show from a family of about 8 monkeys jumping across massive gaps between tree tops for about 15 minutes. We felt extremely lucky to have been in the right place at the right time. Tomorrow we leave here and head to Taman Negara, a massive and ancient rainforest. Looking forward to it, and hoping not to come across too many leeches!